At first glance, these bananas look just like any other bananas, right? Almost perfectly ripe - still firm with just a tinge of green on the peel, but a few sugar spots developing as well. You would think they had been sitting around for a day or two, and have five days or so to go before they turn brown and mushy. Well, you would be wrong. As near as I can reconstruct, I bought these bananas ten days ago at the latest, and it could possibly have been even earlier. They were quite green at the time, so I knew I would have to wait a few days before they were consumable. But ten days? They stayed green forever. By the fourth or fifth day I thought maybe they actually were a new breed that didn't turn yellow when ripe so I tried to peel one. I could not get the peel off and the banana was hard and dry. They finally looked like they were starting to turn yellow over the weekend, but they still felt hard inside. Yesterday morning they looked ripe, as you can see above, but they still felt hard. And, they had been sitting in the fruit bowl for an unbelievably long time. Even if they weren't hard, there's no way I was going to eat one. I did decide to peel one in the interests of science, however. 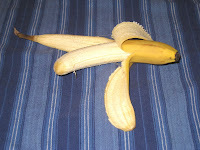 It was really hard to break the top part off, and the tip of the banana turned to mush as a result. The rest of the banana looked ok, as you can see, but it was still hard and dry and had no detectable odor. I've never seen a banana that did not go from hard and green to brown and mushy within a week. Have you? I bought greenish yellow bananas from Costco. After 5-7 days they started to get the brown spots. 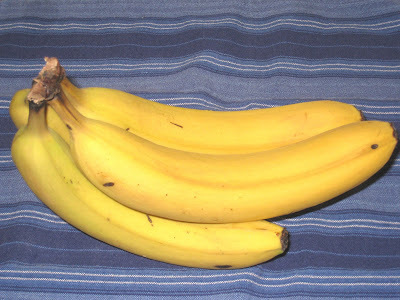 The bananas are almost completely brown but the inside is as hard as a green banana. My guess is that the growers have genetically changed them or are treating them with who knows what to preserve them for longer periods of time.